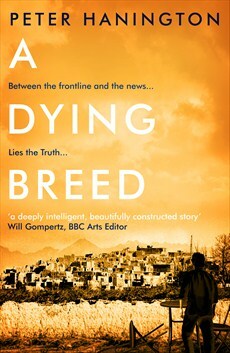 A Dying Breed is an intelligent thriller set in present day Afghanistan. By focussing on journalists and their work it avoids a lot of the guns and gunplay aspects of many thrillers set in this part of the world. And informed by Peter Hanington’s many years as a foreign correspondent, there is an air of veracity around the characters and their interactions. The plot of A Dying Breed runs along some fairly well-worn lines. The killing of an Afghan politician is picked up as a story by William Carver, an on-the-skids journalist. While it appears the killing was the work of the Taliban, some irregularities and the appearance of some shady military characters point to what could be a much bigger and more complex story. But when Carver starts to dig, the British apparatus of State turns its attention to preventing his further investigation. There are a number of aspects of this novel that sets it above the fray. The first is the characters. William Carver is irascible, heavy drinking and unlikeable, still carrying some guilt about his role in boosting the Iraq war and impossible to deal with. But while it first appears that he will be the centre of the book, Hanington branches out particularly to his colleagues – BBC executive Rob Mariscal, former colleague of Carver’s now rising up the greasy pole and extremely compromised morally and financially, and Patrick Reid, the young producer sent out to Afghanistan on his first overseas posting. Secondary characters such as the British Ambassador Lever and Karim, Carver’s local support, also get a chance to shine. The second is the way in which Hanington uses his plot to explore and reveal the state of modern Afghanistan. He is particularly keen to explore the Taliban and its role in the drug trade although there is a fair amount of spoon feeding and exposition around this element of the novel. He also highlights the potential conflicts associated with the active promotion of British business interests in developing countries (UK PLC). Some elements of this latter element, revolving around a pending national telecommunications contract, are reminiscent of the recent BBC series The Honourable Woman. Hanington is also interested in the media and examines the compromises made by embedded journalists and the ways in which Afghanistan is portrayed back in the UK. Hanington has a great feel for both his characters and their milieu and this makes A Dying Breed both an effective and illuminating thriller. He eschews the usual lone wolf action hero style for a more intelligent, considered plot which manages to impart a lot of information and opinion in a manner that is on the whole both engaging and entertaining. As a debut novel, in particular, this is well above average and it will be interesting to see what Hanington does next.